We made a 3-day-2-night trip to Mutiara Damansara last weekend to visit Ethan’s newborn cousin, Jonathan. On Saturday, we had lunch at Tony Roma’s. 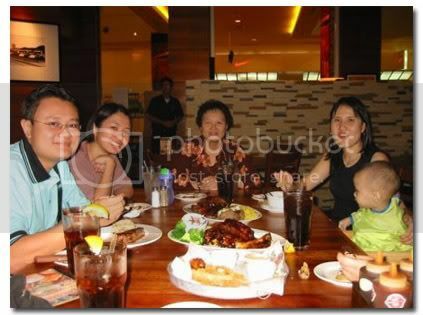 We had great company during lunch too, Ethan got to meet up with his Ah Mah (my Mom), his Ah Kor, Ah Koo and Ah Kim. Tony Roma’s is located in Cineleisure, which is somewhat connected to The Curve; I was amazed to discover that it was a mere walk from Italiannies and Laundry Bar (actually we were undecided as to what to eat that day, but since Tony Roma’s looked rather empty, we decided that would be it). Tony Roma’s in Malaysia is so different from the ones in US or Singapore. For one, it did not have (my favorite) baby back ribs. We ordered 2 plates of full-rack ribs and a strip-loin steak, oh and of course a plate of the appetizer sampler too. Though different, Pete and I were happy to note that the food at the outlet was very good. The ribs were soft and (can I say) finger-lickin’ good. Actually we were afraid that the food would be a sore disappointment like Marché was last month, but we were glad that our fears were unfounded. Ethan had a good time during lunch too. I was thrilled to note that Tony Roma’s Cineleisure had on their menu the same Baked Potato Soup I had ordered for Ethan when we were in Tony Roma’s Suntec City, Singapore… so I ordered that for him. It all started ok, but then our boy decided that he wanted to have a go at feeding himself. Since I had brought along his set of toddler utensils, I gave them to him and he began scooping the soup bit by bit. And scoop he did… bit by bit fell on the front of his shirt. It was a very messy sight indeed. Then I suddenly remembered I had also brought along his Ikea shirt-bib, so we helped him put that on. But no sooner had we done that, Ethan decided that he wanted ME to feed him instead! Sure looks messgy but what the heck – it was fun right??! Btw, I tried looking for those shirt bibs @ Ikea 2 days ago. Cannot find wor……….do you know if they still have them in stock? Joyce says: When I was in Ikea last weekend, I didn’t see those bibs anymore. I think they must have all been sold out! Hehe…I live in Penang la..
Joyce says: Toddlers learn by imitation eh? 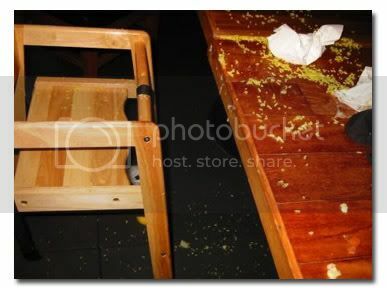 Good la be messy in the restaurant..mummy don’t have to clean up ma….but if at home…*faint*..
Ahahaha… Ethan looks like he enjoyed his food! LOL! Glad to know that your Tony Roma’s trip was better than mine. Hehehe. Joyce says: I’m sorry, I didn’t know your trip was not that good. Maybe we meet there next time so you can give it a second chance? Joyce says: More mess means more enjoyment eh? Joyce says: Hah, I wonder if we’ll be welcomed the next time we go there! 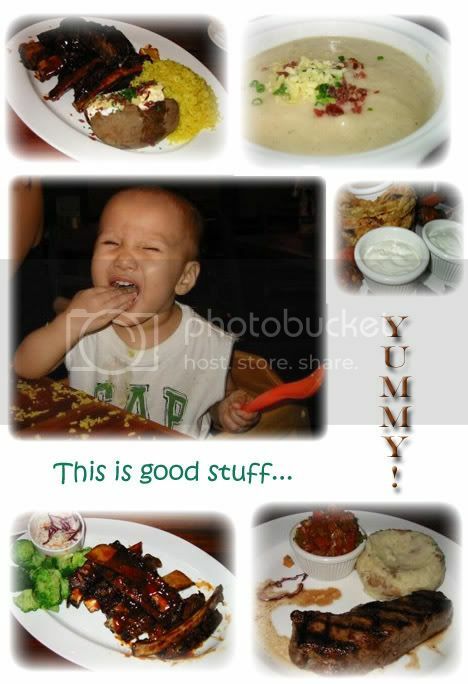 keke..
heh… ur boy really enjoy the food very much … look at the pix …. i been there once …. love the ribs and the soup …. really good.